This article is to help you better understand a condition that is becoming more common due to the increase use of technology and imbalance of internal body chemistry. The technology comes in the form of laptops and cellphones contributing to poor posture. Imbalanced body chemistry can lead to hormonal imbalances and appear as Cushing’s Syndrome. Both of these conditions are examples of the appearance of a hump in the upper back referred to as Dowager’s hump. Dowager’s hump or sometimes referred to as buffalo hump is a structural change affecting the upper back. A condition that presents with a fatty tissue pad at the upper back area, typically between the 7th cervical and 2nd thoracic vertebrae. There is an associated abnormal curvature in the upper back resulting in what is called hyperkyphosis. The word “hyper” meaning abnormal accentuation of the curve. Fixing Dowager’s Hump when it is due to chronic poor posture is fairly simple when approached correctly and with consistency. It is most important to focus on the underlying condition in an effort to prevent the structural hyperkyphosis from worsening. Before beginning any program to treat or relieve the symptoms of hyperkyphosis, it is necessary to seek advice from a medical professional to avoid exacerbating the pain or aggravating another medical condition. A recent study in California showed that a small group of elderly women trained in yoga saw a slight reduction in their spinal curvatures after taking yoga classes three times a week for six months compared to a similar group of women who didn’t perform yoga (2). Hyperkyphosis have been improved by using mirror image upper back extension rehabilitation. 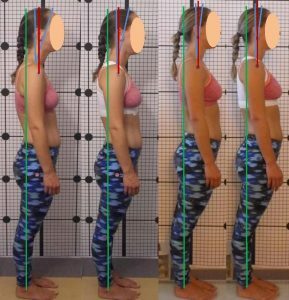 One example was of a 15 year old who after 13-months of treatment displayed a significant reduction in hyperkyphosis and a dramatic correction of her overall posture and spine alignment (3). 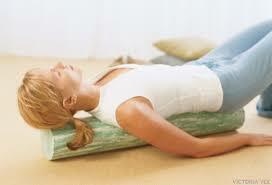 Step 1: Place foam roller so that it runs lengthwise with your spine. Step 3: Open your arms out to your side so you feel a stretch in your chest. Slowly increase the amount of time you are in this position from 2 mins to as much as 15 minutes. The longer you stay in this position the greater the benefit. Muscles of the chest include pectoralis major and minor. They get tight when we are doing to much computer work, slouching at the computer or hunched over texting. Stretching this muscle group regularly will release the pull they are putting on the upper back accentuating the kyphosis. Step 1: Find a doorway and stand in the middle so your arms are equal distance to door frame. Step 2: Place your arms in Position 1 and with your strongest leg forward lean into the stretch. You should feel a stretch in your chest. Next stretch in Position 2 and 3. Step 3: Stretch in each position, holding for 1 min each and repeating each one three times. These are best done daily and gently. Remember to keep you head up and straight. A Posture Brace can help improve posture often times immediately and with lasting positive results. Dowager’s hump can have many causes, so it’s important to have a health practitioner rule out serious conditions that require medical intervention. When Dowager’s hump is caused by chronic poor posture focus on posture correcting modalities. You can go to our Posture Brace Review page to learn more about Posture Braces. The most important thing to keep in mind is that you must use the brace regularly. Always seek medical help if you think your condition is serious. Consider working with a posture expert to fix your Dowager’s Hump for good!